Webhook Relay lets anyone to receive webhooks and expose web services to the internet without having public IP or configuring NAT/firewall. A lightweight, cross-platform solution to relay, proxy and debug all your webhooks to public and internal destinations. No custom protocols - no lock-in. Use a variety of methods to connect, from our cross-platform CLI, Docker image, Kubernetes ingress controller to WebSocket server. Choice is yours. Webhooks can be resent and inspected. All headers, body and HTTP methods are available for inspection. Relayed webhook traffic is recorded and stored in our database. Our tools enable compliance with regulators and auditors. Fan-out single webhook to multiple destinations. For example a Sendgrid webhook can be sent to multiple marketing and CRM services. Single ingress controller to route traffic to any namespace. Cloud agnostic. Define ingress resource once, run anywhere whether it is Google Cloud, Azure, AWS, Docker for Mac with Kubernetes support or Minikube. The only requirement is Internet connectivity. 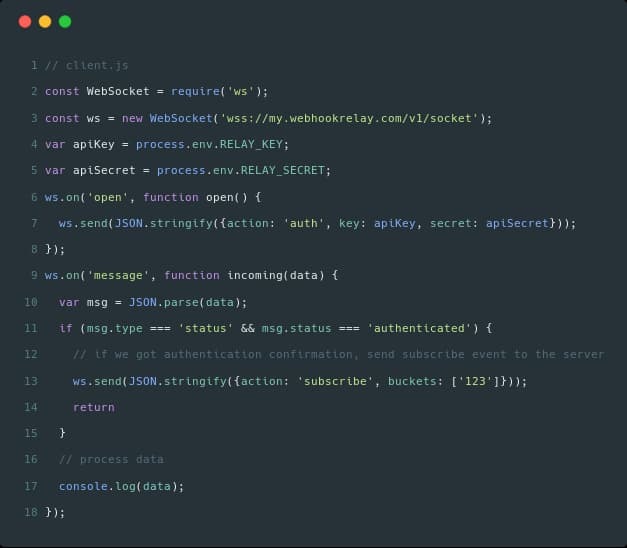 Webhook Relay Socket server allows any WebSocket client to connect and start receiving webhooks. This enables applications to receive and process webhooks without running a web server or even have a public IP. Webhook Relay Home Assistant add-on provides easy to configure and secure tunnels for home automation hub. Create multiple tunnels to different services, connect voice assistants such as Google Assistant and Alexa to control your Home Assistant using Google Home, Amazon Echo or your Android/iOS phone. Develop integrations with Stripe webhooks on localhost. No need to deploy your service to cloud or configure firewall/NAT on your service. Same endpoint will work no matter where you are working today, whether it's home, office or a coffee shop. All webhooks can be inspected and retried through the Webhook Relay dashboard. No need to constantly redeploy your work in-progress to get feedback from colleagues or clients. Webrelay creates a public endpoint (http://yourapp.webrelay.io) bridging to a private (or local) webserver. Anyone can connect. Basic and token authentication methods are available for the tunnels. Use relay agent with Keel to receive Webhooks from DockerHub, Quay, Azure or any other registries to enable automated updates on image push for your Kubernetes clusters. Rancher. OpenShift or any other certified Kubernetes distribution is supported. Stop polling, it's time to relay! Jenkins can be a great target if exposed to the internet. With Webhook Relay there is no need to expose your Jenkins to the internet. Use our webhook forwarding feature to securely deliver Github, Gitlab or any other source control management system webhooks to your internal Jenkins CI server. Stop polling, it's time to relay. Use our encrypted tunnels to securely expose your home automation services without having public IP address or configuring NAT. Binaries also available for arm architecture so you can run it on Raspberry Pi or similar hardware. Integrate directly through WebSockets or Node-RED provided node - no need to run a web server on your device to receive webhooks. Or choose our lightweight agents to run alongside your applications. Binaries available for arm architecture so you can run agents on Raspberry Pi or similar hardware. Yes. Free tier gives you 150 webhooks per month and 1 HTTP tunnel which is great for demoing your websites. However, since this tunnel is not an HTTPS one, please be aware that traffic is not encrypted. We support all mayor credit cards. Subscriptions and payments are processed using Stripe. So you may see these names appear on your credit card statement. 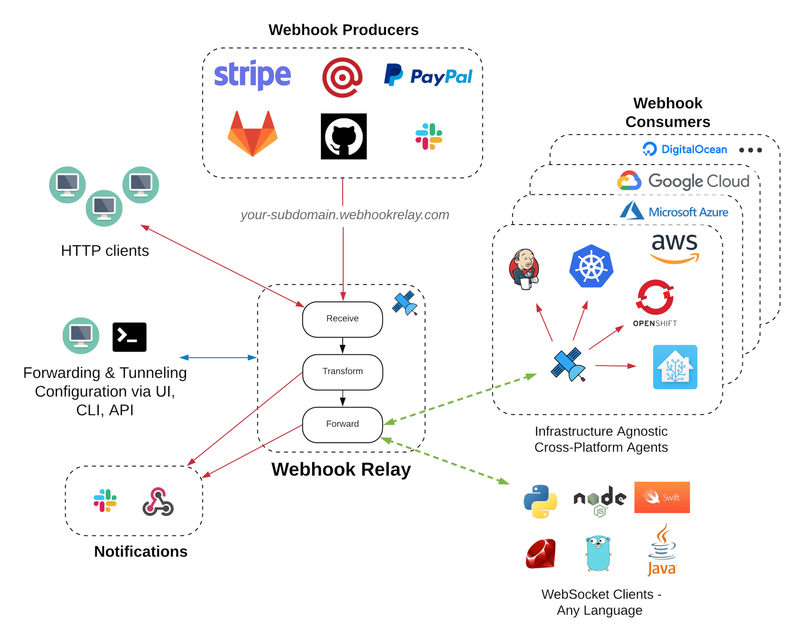 To reach services on your internal network Webhook Relay uses cross-platform agents or WebSocket connections. Your application connects to my.webhookrelay.com cloud server and awaits for new requests. This way you don't need to configure your router or even have a public IP. Yes, please contact us at [email protected] so we can talk about your use case. Current tiers are usually not suitable for fleets of agents when working with IoT or using Webhook Relay tunnels as a backend for your infrastructure. Can I get a self-hosted version? Yes, please contact us at [email protected]. Both webhook forwarding and tunneling services are available as a self-hosted solutions. Can I get a longer logs retention policy? Yes, for audit purposes we can offer up to 2 years of logs retention policy. You can also always export them to your own storage through our provided official API. Is it possible to have a custom domain name with HTTPS support? Yes, our Pro plan includes a managed TLS certificate feature where Webhook Relay servers retrieve certificate on your behalf. Then, new tunnels can be created with that domain name, passing HTTPS certificate validation. Another alternative is to use TLS pass-through tunnels where your server would be serving TLS certificates.